When food goes missing on Ed's farm, Detectives Wilcox and Griswold do what it takes to track down the thieves. 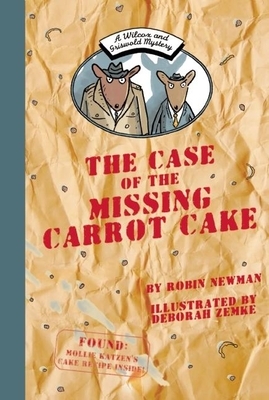 In this case, Miss Rabbit's carrot cake has disappeared. Has it been stolen? Or eaten? Or both? Who dunnit? Raised in New York and Paris, Robin Newman was a practicing attorney and legal editor, but she now prefers to write about witches, mice, pigs, and peacocks. She lives in New York with her husband, son, goldfish, and English cocker spaniel, who happens to have been born on the Fourth of July. Deborah Zemke puts words and pictures together in unexpected and lively ways. The author and illustrator of more than 20 children's books and a frequent contributor to Ranger Rick magazine, she lives in Columbia, MO.